This is not a definitive guide but we will add to it so that it helps those who haven't installed radio control into live steam. I have had to learn a lot of this with help from various sources, including many other garden railway builders. My thanks to them. There are many places on the Club site where this is discussed. I will try and find a few - I know where mine are but if any other contributor knows of other places, please feel free to add links to this page. 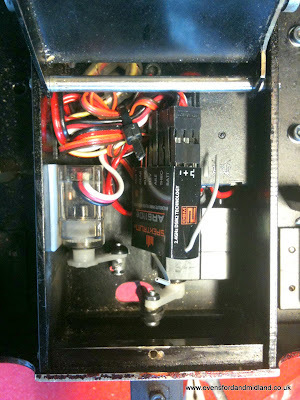 I have a Spektrum DX6i transmitter (Tx). For compatible receivers, I have used the 6 channel AR6100 and AR6100e. The current version of that is the AR6110 and AR6110e. The combination kits come with larger receivers and if you buy from a decent dealer, you may well be able to negotiate to swap the receiver for these smaller versions. The dealer is on a bit of a winner because the AR6200 is a bit dearer than these. I prefer the "e" model because the connections are on the end and I find this is easier to fit in, although I can imagine situations where the other layout would fit better. The specifications are below. They make a big deal about light weight of course but I am much more interested in the size and shape. 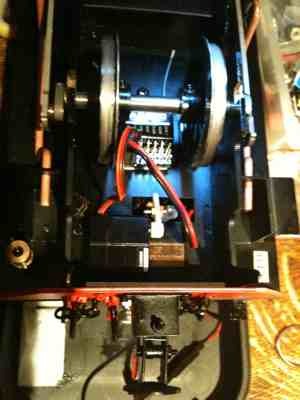 Here in the UK, I buy my Spektrum kit by mail order from Phil Greeno Models in Harrow 020 8866 7770. I have always had excellent service from him and his prices are good. He also has an ebay shop but you will usually pay slightly less by ringing him direct. Horizon Hobby http://www.horizonhobby.co.uk/ are the distributors in the UK. I had one AR6100 which stopped functioning. I contacted them and sent it back. They replaced it without quibble. Excellent service. I have also bought AR6100e receivers from ebay in Hong Kong. Since the new AR6110e versions came out, they had been selling these earlier models at around £11.00 each but I see none listed at that price today (4 Feb 2011). The Spektrum AR6110 weighs less than 3.5 grams making it the lightest 6-channel conventional plug aircraft receiver on the market. Antenna locations give the AR6110 improved signal path diversity. The receiver also features a red LED (labeled with H) that indicates the number of holds that have occurred since the receiver was last powered on. The AR6110 is compatible with all aircraft DSM2 radios and module systems and is designed specifically for microite use only. Please note that the AR6110 receiver is not compatible with the DX6 radio system. 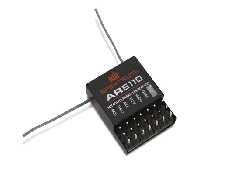 The Spektrum AR6110e weighs less than 4.3 grams, making it a very light 6-channel aircraft receiver option, the end pin layout making it ideal for use in small compact lightweight airframes. Antenna locations give the AR6110e improved signal path diversity. The receiver also features a red LED that indicates the number of holds that have occurred since the receiver was last powered on. 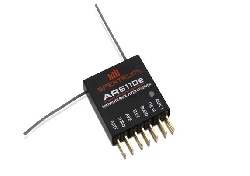 The AR6110e is compatible with all aircraft DSM2 radios and module systems and is designed for specifically for smaller models and confined flying fields only. Please note that the AR6110e receiver is not compatible with the DX6 radio system.